Making a documentary or film requires stepping outside of the agency box – people aren’t just crafting ads or doing social. It’s time to break the rules, pirate style (more on pirates later) and play the long game. Marketing agencies often share the same objective as each other, especially in sports marketing and sponsorship. Generally, the goal is to make a connection with the client’s audience through a shared passion. What drives us is the same – the ability to create a brilliant idea that forms a connection. If you’re suggesting a bold and original documentary to your client, do not worry they about being dismissed for thinking outside your box. Instead, try taking a leaf out of a pirate’s playbook: smash that box into tiny pieces. In Be More Pirate, Sam Conniff Allende describes how being unconstrained by the way things should be allowed pirates to experiment with the way things could be. Making long-form content is about breaking the rules; when we do that, feature-length productions become a very real possibility for marketing agencies. We watch films or documentaries with the hope of having a profound emotional experience. Yet, when we’re making short-form content for brands, we don’t keep the same ambition. It’s style over substance. Immediacy at the expense of impact. Science overshadowing art. Brands should aim for the same level of storytelling we expect when seeing a movie. Now let’s consider the pay-off because there should always be a commercial prerogative in branded content. Increasingly, short-form is a numbers game. Facebook delivers viewing figures that rival most linear TV ratings: likes ratchet up to create unrivaled engagement rates. However, the reality is that most views are bad views. Salesforce data shows that viewers in some markets watch less than 25% of a video. In today’s culture, only the first 10 seconds of branded content really matter. Conversely, streaming sites like Netflix have exploded with the popularity of “binging” – spending hours at a time watching the latest show. The technology has changed but the human truth hasn’t: create a powerful story and people will happily invest their time in it. Online video platforms allows long-form content to keep viewers engaged far-beyond other branded content; they are able to watch again and again. Long-form would last indefinitely here. Audiences are smart. They can see sincerity in content and they appreciate the care a brand gave to tell that story. 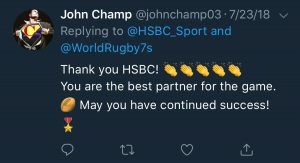 We confidently included “HSBC Presents” in the title sequence of The Pioneers, a documentary following USA Rugby Sevens’ journey. This film evoked warmth and a sense of cool (that coolness is something most banks very much want). A “thank you” also comes from broadcasters and OTT providers: they see the opportunity to screen a high value production. Agencies are able to distribute long-form content cheaply since the marketing budget already covers production costs. I got to tell HSBC our documentary would be premiering in prime time on NBC Sports, a promotional partnership that included several free advertisement spots for The Pioneers. Along the way, we defied the rules, worked with awesome people and made a film to be proud of. So be pirates: raise your skull and crossbones, break some rules and play the long game.